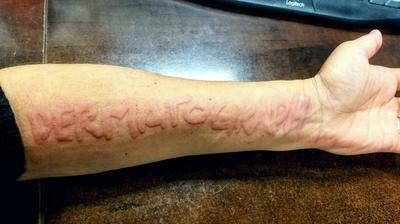 Dermatographism skin writing disease on forearm possibly linked to heartburn, allergies, and fatigue. I first started experiencing the pressure related welts and subsequent hives about six months ago, and was diagnosed with dermatographism after figuring it out what it was for myself online. At the time, I had been experiencing serious heartburn as well, but did not consider the two likely to be connected. My thyroid was tested and checked out okay, so my doctor prescribed me with type A and type B antihistamines for the symptoms, saying that one of the type B antihistamines indicated it may help with heartburn as well (though my doctor still did not actually link the symptoms). Before I could fill the prescription, it seemed that all my symptoms just disappeared, without a trace, so I never tried using the type B antihistamine. The type A antihistamine had not worked AT ALL. In the last three days, the dermatographism, constant hives, and 24 hour a day heartburn all returned full force at the same time, possibly from allergies and the spring thaw, or extreme stress right now, or both. Super strength antacids do not help, nor does yogurt, but this chest pain is almost intolerable. I have dealt with allergies and hives all my life, though nothing quite like this, so I have learned to ignore my lips, eyes, and other odd swellings. But this heartburn I cannot ignore, nor the feeling of extreme fatigue like I have just hit a wall at the end of each day. I am told that very little is understood about dermatographism. Could all of these issues be linked to an extreme allergy reaction, an auto immune disease, diet, or the symptoms for a deeper underlying problem? I want for it all to END, but I do not exactly relish the idea of being on two different kinds of antihistamines for the rest of my life, and one of them was not working anyway. Any suggestions for relief, or getting to the bottom of the actual problem rather than simply attempting to alleviate the various symptoms with medication? It is frustrating to not be able to find any relief!